Toyota Electric Cars – Toyota Electric Motor Cars Info – is there? What about Toyota Electric Cars? Toyota is an amazing Company. Not only that they became the biggest carmaker in the world, offering three brands (Toyota, Lexus, Scion) to the US market. They also introduced major innovations into the mass car market – where it belongs to become a success. 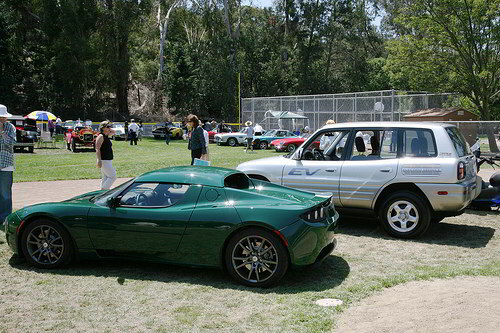 Did you know that they were the first carmaker to offer new electric cars to the public and mass market. Well, only that your great-grandfather could already buy lots of electric cars in his time, but that is another story. The Toyota RAV 4 EV (Electric Vehicle) was introduced in 1997 and received lots of attention. But Toyota discontinued the vehicle in 2003 despite a long list of preorders. Toyota believes that in order to have a positive environmental impact, a large number of consumers must embrace the technology. In order for this to happen, the vehicle must meet the lifestyle needs of, and be affordable to, the mass market. Although a significant marketing effort was undertaken for the RAV4-EV, we only sold about 300 vehicles a year. In addition to overall customer acceptance, technical issues tied to electric vehicles remain a major hurdle. Industry practice regards batteries to be at the end of their useful life when capacity decreases to 80% of original capacity. A battery’s capacity is the amount of charge that it holds, and is commonly measured by the range of the vehicle. It is cost-prohibitive to replace an EV battery. The cost to replace the battery is more than the value of the vehicle. I do not know if they regret this step with the dramatic rise in public attention to Electric Vehicles at the turn of the decade (2010). Even if they hadn’t made profits from this technology they would now have a loyal customer base and even more experience in this technology. Instead they put their bets on a Hybrid (“hybrid” meaning a combination). So Toyota does not build Electric Cars in the classical sense, they decided to develop vehicles which use gas and electricity. But since these cars are “half electric” they still belong here. So in 2000 they brought the Prius to market. It was an instant success, especially in the media and with Hollywood celebrities. But gas will run out sooner or later. What will the Hybrid technology be worth then? Sure, the Hybrid technology seems to be the best of all worlds right now. And Toyota claims that a lot of the technological advancements necessary for the Prius had actually been made for the RAV 4 EV. But a Hybrid in my opinion can only be a step in between. Since gas engines are tweaked to the limit (are they? I always wonder how all the car makers can just forget about adding a Hydrogen Car Kit – to today’s engines seems to me as if somehow they are interested in burning as much oil as somehow explainable to the public) and at the end of their life cycle due to ecological and crude oil reason. But it seems clear that Toyota is betting on a Electric Vehicle future, and not a Hydrogen drivetrain as others do. And yes, in 2010 Toyota has bought a share of the highly innovative Tesla Auto maker and announced that the two will cooperate in order to develop electric vehicles, parts and production system and engineering support. I believe that is a very smart move, since Tesla has shown the ability to be highly innovative and creative and can develop a car in half the normal time. Back from Toyota Electric Cars to Home of Solar Energy.